One of my favorite things in the whole world is buffalo chicken. I love to go to Buffalo Wild Wings and get the buffalo chicken tenders (because I’m a weirdo who doesn’t like wings). This however, gets expensive, and I don’t need the extra carbohydrates right now, so when I was craving BWW’s the other day, I knew I was going to have to come up with an appropriate solution. 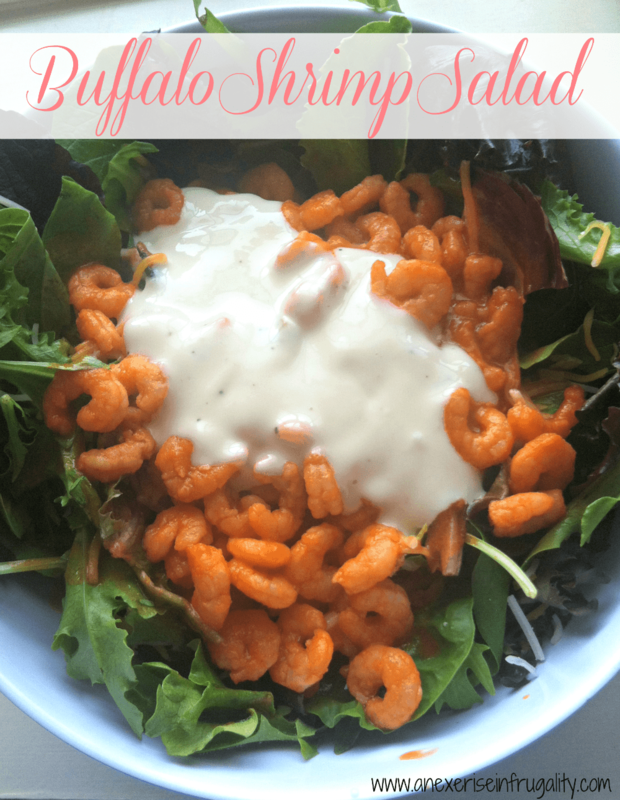 So I took the buffalo shrimp concept, but omitted the breading/batter and got an amazing salad that perfectly satisfied my craving for spicy, tangy buffalo sauce and cool, creamy bleu cheese dressing. It’s so easy, I can’t even call it a recipe. Just take about a cup of cooked shrimp (I used frozen mini shrimp), saute in about 2 tbsp of butter and 1/4-1/2 cup Frank’s Red Hot Sauce (or the hot sauce of your choosing, just make sure it doesn’t have any added sugar if you’re watching your carbs!) and a dash of garlic powder or garlic salt. I cooked this for a few minutes on medium-high heat until the sauce started to thicken slightly so it “sticks” to the shrimp. Then scoop the shrimps out and put on a bed of mixed greens. I used a 50/50 mix of spring mix and baby spinach but you can use whatever works for you. You can spoon some of the yummy sauce into the salad too, if you’re feeling feisty. Then top with your favorite bleu cheese or ranch dressing. YUM. Takes less than 5 minutes to make, and its a delicious lunch. You can even prep your shrimp the night before and store in a tupperware to put on your salad when you’re ready to eat. Of course, you can add other salad fixins to this. I did a sprinkle of shredded cheese, but avocado would be tummy also. Obviously the shrimp could be substituted for shredded or diced chicken as well, and still be super deeeelish! This recipe is compatible with a low carb diet, depending on the buffalo sauce and bleu cheese dressing you choose.